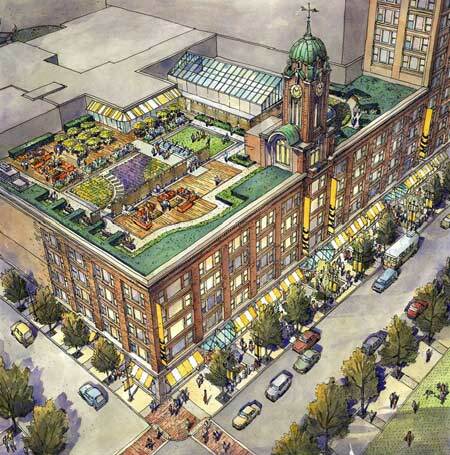 Artist rendering of the redeveloped Sibley Building. High Tech Rochester (HTR) will expand its operations to the center of Rochester, creating an incubation facility that will serve as the cornerstone of the city’s new innovation zone. The $24 million facility will be located in the Sibley Building. HTR – an affiliate of the University of Rochester – is the region’s only state- and federally-designated incubator and provides the comprehensive array of support services, resources, and space necessary to foster the growth of high tech start-up companies. The new facility is possible due to support from New York state. Last week, HTR received $5 million in funding for the project – for a total of more than $10 million over the last four years – from the state through Governor Cuomo’s Regional Economic Development Council initiative. The funding will support the creation of the Finger Lakes Business Accelerator Cooperative, which is being led by HTR in partnership with RIT, Excell Partners, and the region’s Small Business Development Centers and Industrial Development Agencies. The accelerator’s new hub at the Sibley Building will provide support for start-up companies across the nine-county Finger Lakes region. The Center for Governmental Research projects that the accelerator will create 1,000 direct jobs over the next five years. The new 68,000 square foot facility at the Sibley Building will consist of co-working space, traditional office space, state-of-the-art dry and wet labs, conference rooms, and a 100-seat auditorium for programs, workshops, and community events of interest to the region’s entrepreneur community. HTR will relocate its headquarters to the new facility when construction in completed in 2016. HTR’s current home in Henrietta, the Lennox Tech Enterprise Center, will remain open as a satellite location. The historic Sibley Building is in the midst of a $200 million restoration by WinnDevelopment. The 1.1 million square foot building – the largest in Monroe County – is being transformed into a mix of apartments, office, and retail space. The Finger Lakes Business Accelerator Cooperative will be located on building’s sixth floor. The accelerator will be an anchor for the new Innovation Zone being proposed by the City of Rochester. The HTR facility, along with RIT’s Center for Urban Entrepreneurship, and downtown satellite facilities of Monroe Community College and the College at Brockport, will form the critical mass of entrepreneurial activity, research and development, cultural amenities, residential space, and other business development necessary to create a thriving new district in the city’s core.